We kick started this week with an OK day on Thursday. Had 3 winners in the 9 races, but also cased exactas that returned $14.30 and $28.30 for each $1 wagered. So, a platform to build on as we are headed into the weekend. 1st: 4/1-6/3-5…Say Yes Again (4) gets the first Key Play of the Day in the lid-lifter on Friday. This 3YO Custom For Carlos filly is coming off a near-miss second in the last outing her on Jan. 10 at this same level. Was the even-money favorite in that one, and the barn scores with .34% of those returning to the races as the fan’s top choice. Made the lead and got to within shouting distance before giving up the lead late. Comes from a Stakes-placed mare who has thrown 10 winners from 11 starters. Meet’s top rider takes the reins again. Adds up for me. I bet the 4 to win/place and then key the 4 over/under the 1-6. I will key the 4 over (only) the 3-5. 2nd: 8-7-9/5/1-6-3…This is the first grass race of the day, and I will go to the outside for my top 3 picks. Gioblast (8) comes back for her third career start after two straight 4th place finishes. 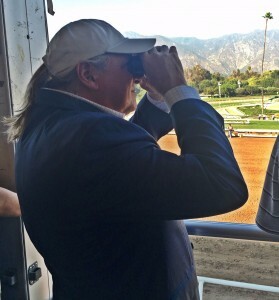 Gets the blinkers for the first time today, and the barn hits with .17% of those getting the shades. The work on Jan. 6 was solid, and a hot rider takes the reins again. Over the last week, the jockey has a 3-0-3 in 12 starts. Family Ties (7) actually edged our top pick in the last outing, finishing third in that race. Interesting running style to drop back in the second turn and then make another rally. Same jock gets the saddle assignment and the rider has hit with .12% of the last 50 rides for this barn. That is about half of this barn’s win percentage here this meet. Interesting. Barn hits with .34% of those getting the grass for the second time. Houston Strong (9) could spice up the odds rack here, with 10-1 ML numbers. Gets to the grass for he first time, and should love the move. Sire is by War Front, and the top two finishers in the last race both came back to win. Love the stretch out in distance, too, and the barn hits with .14% of those routing for the first time. Watch out here. I bet the 8-9 across the board and then box the top 3 in the exacta. 3rd: 7-6-1/3-2…This is a Maiden Claimer for the LA-breds only, and I give a slight edge to Top Ten Duchess (7). This one returns from three second place finishes in a row and has hit the board in each of the last four tries. Was the beaten favorite in the last out, and the barn scores with .20% of the last 54 of those. Gets a top rider in the irons for the first time. Take note. Arch’s Li’l Nieta (6) comes from a top barn operation, which has won with .20% of the last 211 starters. This one ran second by a neck at this level last time out, and now has three top 3 finishes in 4 races. Should make things interesting. I bet the 7 to win/place/show and then box the top 3 in the exacta. 4th: 10-6-(12)/5-1/7-4/2-9-8/3-11-1…The second of the four grass races carded on Friday, and this one will be contested at 11/16-miles. I will go to the outside and gear up with Stella d’Oro (10). Not a good post at all. But this one does get Lasix for the first time and will make the NA debut for a trainer who has a 2-2-0 record in the first 7 saddle jobs this meet. This one trained superbly here on Feb. 2. And, in two tries overseas, this one had a second and a win. Love the 8-1 ML odds, although I expect them to drop. My Upset Special of the Day. In the second spot, I will go with Create Again (6), a speedster from the barn of J. Larry Jones. This one spit the bit real good in the last out. No excuse there. But this one hit the board in the previous 4 races and 6 of the last 7 before the debacle. Gets the same rider back on Friday and does have a 2-1-0 record in 5 starts over this sod. I bet the 10 to win/place/show and then box the 10-6 solidly in one exacta. I will key the 10 over/under the “all button” in two smaller versions, as well. 5th: 6-3/1-2/4-5…A really nice allowance/optional claimer here, and I will go with Fortunate Girl (6). This one ran a solid fourth in the Ginger Brew at Gulfstream Park on Jan. 5. Faced some real, real good ones in that 7.5-furlong Stakes over the grass. Goes to the dirt today for a barn that hits with .18% making this surface conversion. Has been working well since the race, and gets a top rider in the irons. Jock has a 6-1-4 record in the last 18 tries. Drops back to allowance level today and that should help, too. My solid pick. Tasting the Stars (3) goes for the barn of Michael Stidham, and the 3YO Bodemeister filly can run. Broke the maiden here at first ask on Jan. 13. Ran off by over 5 lengths that day. Out of a SW mare, who has 6 winners from 7 starters. All there. I bet the 6-7 across the board and then box those two solidly in the exacta. I will key the 6-3 over/under the 1-2 in a lesser version. 6th: 6-9-3-4/(12)/7-1-2-5…A really nice allowance event over the grass, going 11/16 miles. Wide open, too. As in? Wide. I will spread out in the horizontal plays, and give a slight edge to Frankincense (6) in the verticals. This one won easily when making the barn debut here on Jan. 18. Love the come-from-behind storm march, and the same rider gets back up today. Will face winners for the first time and the barn hits with .11% of those. But the move to the East certainly looks like the right thing for this 5YO. Power Song (9) will be making the second start off a layup, and the barn hits with .23% of those. Is a first time gelding after running in a sprint here on Dec. 26. That was the first race since March of 2018, and looked to be nothing more (or less) than a tuneup for the two turns. Love the work on Feb. 4 after the last race. Looks like one sitting on “go” for me. I bet the 6-9 across the board and then box the 6-9-3-4 in the exacta. 7th: 4-3/5-6/7-1…This is another really fine race, a MSW event going two turns for the fillies and mares. I give the nod to the top two numbers in this sequence. Grandezza (4) ran well here on Jan. 13, finishing up second when stretching out for the first time. Barn hits with .11% of those making the second route run, and the work here on Jan. 28 was really nice. Gets a top rider back in the irons. Dangerous. Temperit (3) will be making the career debut for one of the top barn operations and top young trainers in the game today. This barn is hitting with .24% this meet after 68 starts, and this one trained super here on Jan. 27. Dam of this one has a winner from 1 other starter, and was a SW in her own right. Now a 4YO, but this well-bred daughter of Tapit has all the ingredients to still make a good one. I bet the 4-3 across the board and then box those two solidly in one exacta. I will key the 4-3 over/under the 5-6 and over (only) the 7-1. 8th: 4-5/8/3-10-(12)/1-6-11-7-9…The last grass race of the day is a two-turn event for the fillies and mares. I will go with La Sola Ranger (4), who will be making her first start since May 3, 2018. Ran second that day to a really good one, and this 5YO mare now has a 2-3-2 record in 10 starts lifetime. Has faced stiff comp most of the time, too. Love the work two back on Jan. 27. Gets a top rider in the saddle. And, the last time off a long layup, she returned to win. My choice off the bench. More Fun Again (5) is from the Tom Proctor barn, which is sure to warm up very soon. Could start right here. In 5 previous starts at this distance, this 4YO Arch filly has 2 wins and a third. Third start off the layoff, too, and could be tighter for this one. I bet the 4-5 across the board and then box those two solidly in one exacta. I will key the 4-5 over/under the 8 in two more. 9th: 2-1/7-6-3…Today’s finale is a 6-furlong sprint for LA-breds only, who have not won three races lifetime. I will go to the inside for my top pair. Robert’s Prince (2) ran second at this same level last time out, which was here on Jan. 28. Led late before getting passed at odds of 41-to-1. Heartbreaking. Has hit the board in 7 of 15 lifetime starts, and may be OK again when facing State-breds only for the second time. General Basil Duke (1) should be the horse to beat. Won last time out, but loses that condition and moves up a rank. Gets the same rider back up on Friday, though, and the training sessions have been going well, too. Barn hits with .26% of those that won the last race, and with .10% trying to repeat in the claiming ranks. I bet the 2-1 across the board and then box those two solidly in one exacta. I key the 2-1 over (only) the other three numbers listed in a lesser version.